Mr and Mrs Murder DVD Review In essence, Mr and Mrs Murder is a family crime drama that is rarely graphic and successfully manages to tone down this genre with its mischievous humour and interesting cast members. Mr and Mrs Murder is probably one of those unexpected Australian hits which has a whacky concept that somehow works. The series revolves around Charlie and Nicola Buchanan, two professional crime cleaners who happen to be amateur sleuths and happily married. Unlike the harshness of something like Underbelly, Mr and Mrs Murder is more akin to something like Packed to the Rafters but with a touch of crime, more particularly murder thrown into the mix like Murder She Wrote. Ironically the light hearted nature of Mr and Mrs Murder actually works and I'd be really surprised if this series is not picked up by some American TV station in the future. 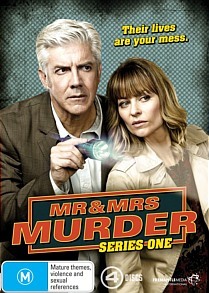 The stars of the show are Shaun Micaellef and Kat Stewart who not only play a realistic husband and wife team but have this great onscreen chemistry with a few laughs thrown into the mix to liven things up. Unlike the more outrageous comedic of Micaellef, his humour is actually toned down a little in this series and works extremely well with the storylines. Also joining the duo in cleaning crime is Johnny Pasvolsky who plays Detective Peter Vinetti. Vinetti is used to link Charlie and Nicola to the string of murders that they investigate in this 13-part story that has been released on four DVD discs. I also love how these two characters get caught in all sorts of mischief, especially when they are trying to examine the crime scenes. Lastly we have Jess (Lucy Honigan), the niece of Nicola who sometimes helps with investigations and is used as a link to the layperson. In essence, Mr and Mrs Murder is a family crime drama that is rarely graphic and successfully manages to tone down this genre with its mischievous humour and interesting cast members. So if you need something enjoyable but with an element of mystery, than Mr and Mrs Murder proves that Australia can produce interesting and entertaining drama series without the gore of Hollywood. From celebrity chef murders to body builder murders, Mr and Mrs Murder uses a variety of real-world inspirations to create a thoroughly enjoyable series!